« EXCLUSIVE JOEL GOMEZ INTERVIEW, PLUS PHOENIX COMIC-CON INFO! This is our BIGGEST CONVENTION of the year, FIENDS!!! The doors to Phoenix Comicon have just opened! If you’re attending the show, you’ll be able to find us at Booth 752 (same location as last year). We’ll have all sorts of crazy and exciting things going for our hometown show! Click here for a full list of events! Lady Death and La Muerta co-writer Mike MacLean will be offering signatures at Booth 752 on Saturday between 2:00 and 4:00PM. Don’t miss out on Coffin Comics panel on Friday at 4:30PM in Panel Room 122ABC! Get caught up on the latest from Coffin Comics straight from the creative minds that make the stories happen! 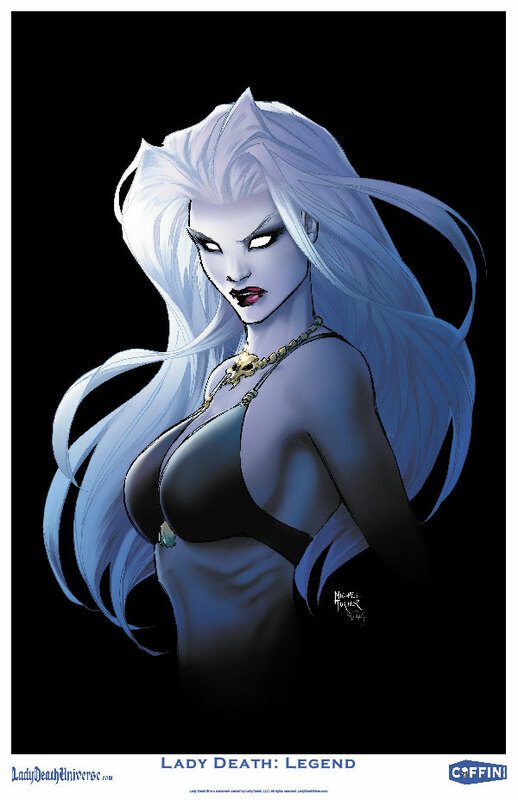 Lady Death creator Brian Pulido and his writing partner Mike MacLean will also be available to answer any questions you may have during the panel! We will be holding DAILY RAFFLES on Friday, Saturday and Sunday of the show at Booth 752. Raffle prizes will include lots of cool Coffin Comics and merch! 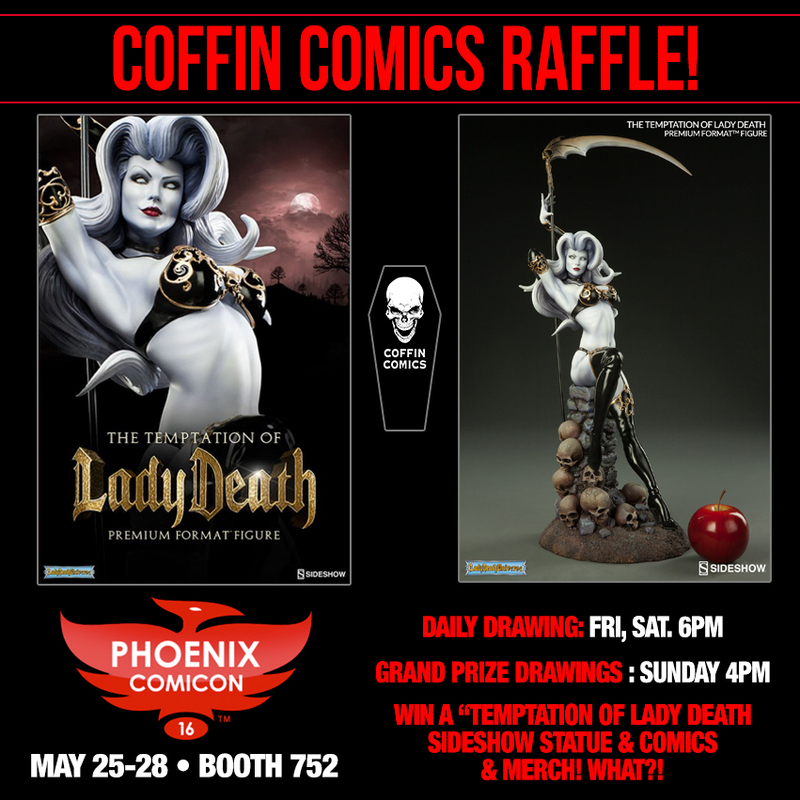 Our GRAND PRIZE WINNER on Sunday will receive a Temptation of Lady Death Premium Format Figure by Sideshow Collectibles valued at $400.00! IMPORTANT NOTE: You must be present at Booth 752 to win and claim your prizes each day of the raffle! 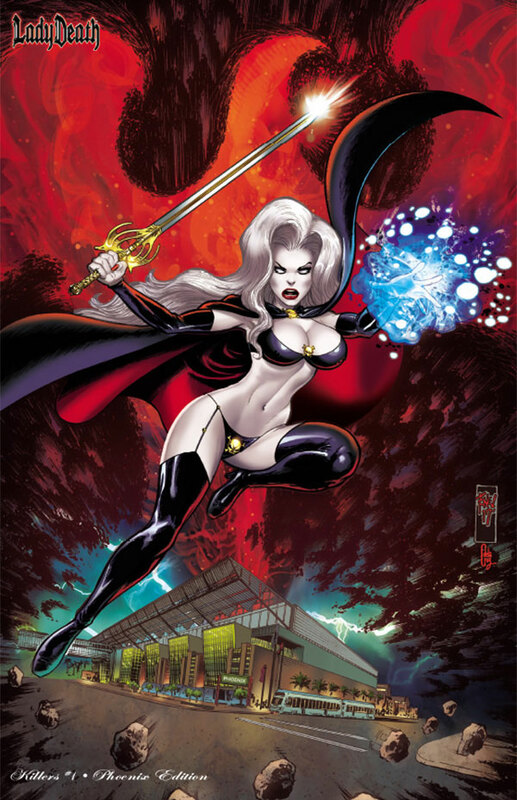 Cover artist Mike DeBalfo will be drawing the cover for Lady Death: Dragon Wars #1 – Instant Edition LIVE at Booth 752 on Friday between 12:30 and 1:30PM! The finished artwork will then be scanned and sent over to colorist Jason Jensen, where he’ll have a few hours to color the cover and send the finished artwork to graphics designer. The completed artwork will be then sent to our local printer and the books will be turned around and ready for pickup at Booth 752 on Sunday at Noon. From concept to completion in less than 48 hours! Other important info in the exclusives listing below – scroll down! 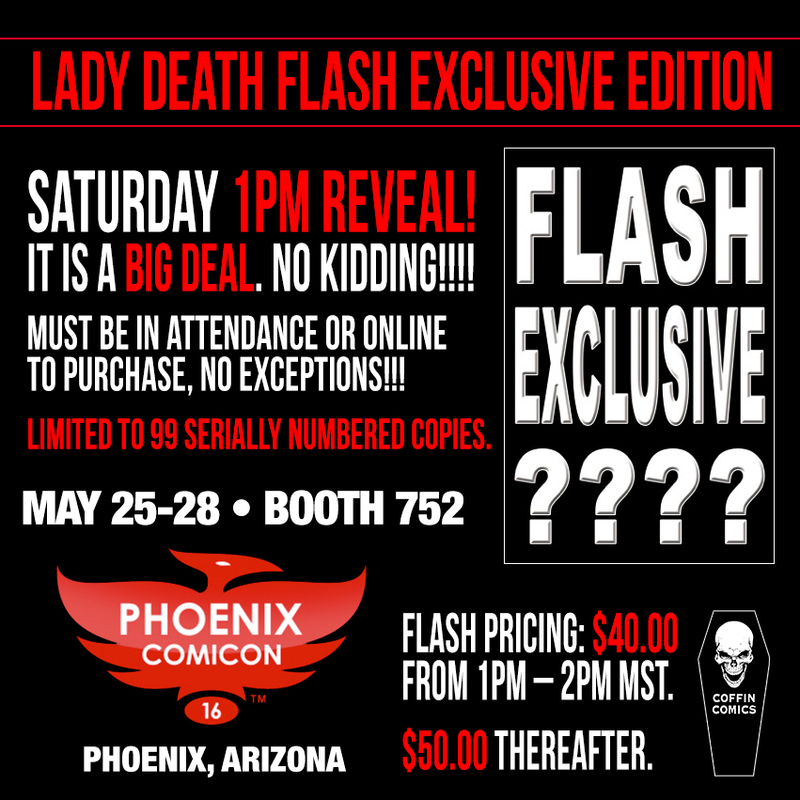 Every year, we introduce a secret Lady Death FLASH EDITION live at Phoenix Comicon! What will it be? Be sure you’re at Booth 752 at 1:00PM on Saturday for the live unveiling! Special pricing on this edition will be $40.00 prior to 2:00PM on Saturday. The price will go up to $50.00 thereafter! Due to anticipated demand, this edition will be limited to one per customer. 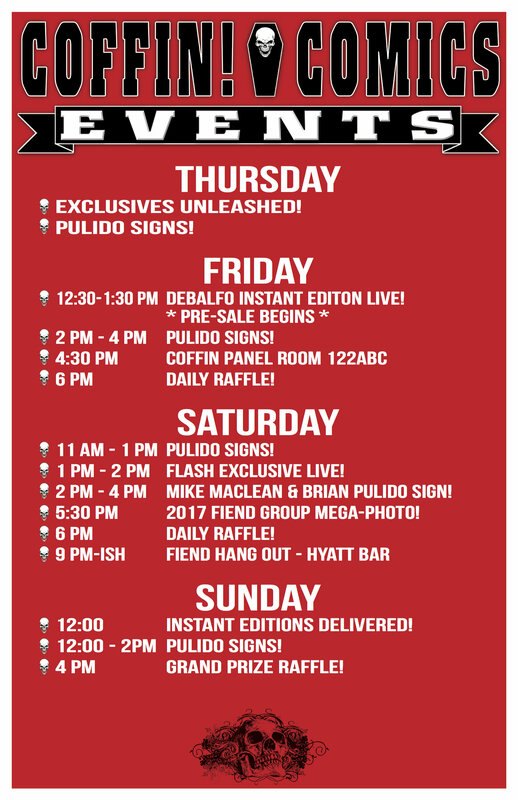 FIEND RALLY AT PHOENIX COMICON! 2017 Fiend Group Mega Photo at Booth 752: Family photo time, FIENDS! Be sure to be at our booth at 5:30PM for group photos! Fiend Hangout at the Hyatt: Come drink and chat with us at the Networks Bar at Hyatt Regency near Phoenix Convention Center at 9:00PM(ish) until whenever! It’s tradition! Phoenix Comicon exclusives will be available for purchase at Booth 752! If you can’t make it to the show, online preorders at Lady Death Store are also live! Please be advised that this is an extremely high demand show and available quantities are very limited! First come, first served! Mike DeBalfo will pencil this cover LIVE at Phoenix Comicon on Friday! Full color, 24 pages. Limited to 88 serially numbered copies. One per customer. No exceptions! Full color, 24 pages. “Virgin” cover art with no trade dress. Limited to just 25 serially numbered copies! What will it be? One thing’s for sure: it will be ‘effin awesome! Preorders for this edition are available now, but the cover will not be revealed until Saturday at 1:00PM. Full color, 24 pages. Premium Holo-Foil cover! Limited to 200 serially numbered copies. Full color, 24 pages. SOLID METAL front cover! Limited just to 23 serially numbered copies for Lady Death’s 23rd Anniversary! Full color 11×17″ print on premium glossy stock. Limited edition of 500 serially numbered prints! Solid metal collectible trading card based on the Zodiac! Production run alternates between silver (odd-numbered) and gold (even-numbered) cards for a combined total of 99 serially numbered cards. SHIPPING ADVISORY: Show exclusives preordered at Lady Death Store will ship beginning May 31, 2017. 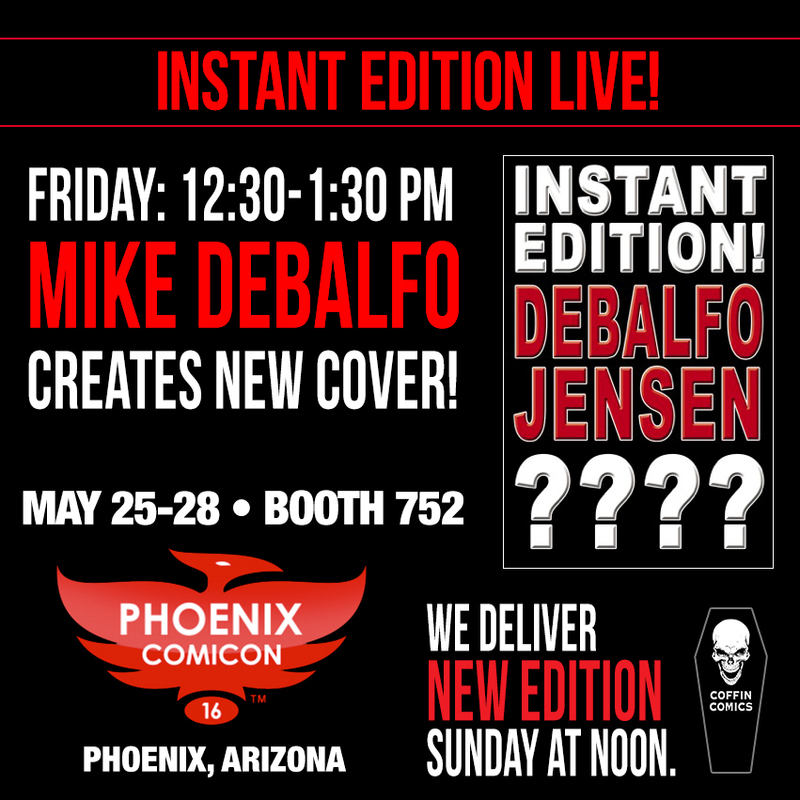 This entry was posted in Conventions, News and tagged brian pulido, debalfo, exclusive, flash, instant, kickstarter, mike maclean, panel, pcc, phoenix, phoenix comicon, phxcc, preorder, raffle. Bookmark the permalink. Both comments and trackbacks are currently closed.